Kraftwerk were formed by Florian Schneider (flutes, synthesizers, violin) and Ralf Hütter (organ, synthesizers) who met as students at the Robert Schumann Hochschule in Düsseldorf in the late 1960s, participating in the German experimental music and art scene of the time, which the Melody Maker jokingly dubbed “krautrock”. They joined a quintet known as Organisation, which released one album, Tone Float in 1969, Schneider became interested in synthesizers deciding to acquire one in 1970. While visiting an exhibition in their hometown about visual artists Gilbert and George, they saw “two men wearing suits and ties, claiming to bring art into everyday life. The same year, Hütter and Schneider start bringing everyday life into art and form Kraftwerk”. Early Kraftwerk line-ups from 1970 to 1974 as Hütter and Schneider worked with around a half-dozen other musicians including guitarist Michael Rother and drummer Klaus Dinger, who left to form Neu! The only constant figure in these line-ups was Schneider, whose main instrument at the time was the flute; at times he also played the violin and guitar, all processed through a varied array of electronic devices. Hütter, who left the band for eight months, played synthesizer and keyboards (including Farfisa organ and electric piano). Their first three albums were free-form experimental rock without the pop hooks or the more disciplined song structure of later work. Kraftwerk, released in 1970, and Kraftwerk 2, released in 1972, were mostly exploratory musical improvisations played on a variety of traditional instruments including guitar, bass, drums, organ, flute, and violin. Post-production modifications to these recordings were used to distort the sound of the instruments, particularly audio-tape manipulation and multiple dubbings of one instrument on the same track. Both albums are purely instrumental. Live performances from 1972 to 1973 were made as a duo, using a simple beat-box-type electronic drum machine, with preset rhythms taken from an electric organ. In1973, Wolfgang Flür joined the group for rehearsals, and the unit performed as a trio on the television show Aspekte for German television network ZDF. With Ralf und Florian, released in 1973, Kraftwerk began to move closer to its now classic sound, relying more heavily on synthesizers and drum machines. Although almost entirely instrumental, the album marks Kraftwerk’s first use of the vocoder, which would in time become one of its musical signatures. Kraftwerk’s futuristic and robotic sound was influenced by the ‘adrenalized insurgency’ of Detroit artists of the late ’60s such as MC5 and the Stooges. The input, expertise, and influence of producer and engineer Konrad “Conny” Plank was influential in the early years of Kraftwerk. Plank worked with many other German electronic acts including members of Can, Neu!, Cluster, and Harmonia. As a result of his work with Kraftwerk, Plank’s studio near Cologne became one of the most sought-after studios in the late 1970s. Plank coproduced the first four Kraftwerk albums. The album Autobahn was released in 1974 saw Kraftwerk moving away from the sound of its first three albums. Hütter and Schneider had invested in newer technology such as the Minimoog and the EMS Synthi AKS, helping give Kraftwerk a newer, “disciplined” sound. Autobahn would also be the last album that Conny Plank would engineer. Following the success of Autobahn Hütter and Schneider invested in updating their studio, thus lessening their reliance on outside producers. The painter and graphic artist Emil Schult became a regular collaborator, designing artwork, cowriting lyrics, and accompanying the group on tour. kraftwerk toured in 1975, this new, stable, live line-up in the form of a quartet. Hütter and Schneider continued playing keyboard synthesizers such as the Minimoog and ARP Odyssey. They also started singing live for the first time, Schneider processing his voice with a vocoder live. Wolfgang Flür and new recruit Karl Bartos performed on self-built electronic percussion instruments. Bartos also used a Deagan vibraphone on stage. In 1976, Kraftwerk toured in support of the Radio-Activity album. David Bowie was among the fans of the record and invited the band to support him on his Station to Station tour, an offer the group declined. Despite some innovations in touring, Kraftwerk took a break from live performances after the Radio-Activity tour of 1976 andbegan recording Trans-Europe Express (German: Trans-Europa Express) at the Kling Klang Studio using the The signature Kraftwerk sound which combines driving, repetitive rhythms with catchy melodies, mainly following a Western Classical style of harmony, with a minimalistic and strictly electronic instrumentation with simplified lyrics sung through a vocoder or generated by computer-speech software. In May 1978 Kraftwerk released The Man-Machine (German: Die Mensch-Maschine), The black, white and red album cover was inspired by Russian artist El Lissitzky and the Suprematism movement. In May 1981 Kraftwerk released the album Computer World (German: Computerwelt) featuring the song “Computer Love” Some of the electronic vocals on Computer World were generated using a Texas Instruments language translator. Kraftwerk began using more vocals and sequencing equipment for both percussion and music. In 1982 Kraftwerk rleased the album Techno Pop featuring the song “Tour de France”, which was used in the 1984 film Breakin’, Sadly During the recording of “Tour de France”, Ralf Hütter was involved in a serious cycling accident. He suffered head injuries and remained in a coma for several days. During 1983 Wolfgang Flür was beginning to spend less time in the studio. Since the band began using sequencers his role as a drummer was Diminishing. After his final work on the 1986 album Electric Café (a.k.a. Techno Pop) he left the band in 1987 and was replaced by Fritz Hilpert. In 1990 the band played a few secret shows in Italy. Karl Bartos left the band shortly afterwards. The next proper tour was in 1991, for the album The Mix. Hütter and Schneider wished to continue the synth-pop quartet style of presentation, and recruited Fernando Abrantes as a replacement for Bartos, however Abrantes left the band shortly after. 1997 Kraftwerk appeared at the dance festival Tribal Gathering held in England. In 1998, the group toured the US, Japan, Brazil and Argentina. In 1999 the single “Tour de France” was reissued And The single “Expo 2000” was alsoreleased in 1999. 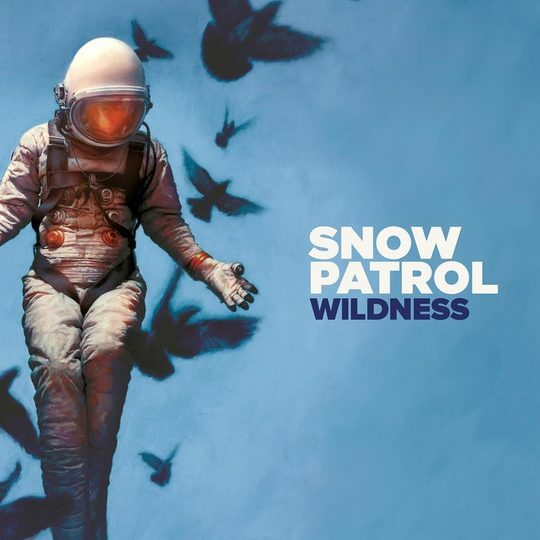 This was later remixed and re-released as “Expo Remix” in 2000. In 2003 the band released Tour de France Soundtracks, its first album of new material since 1986’s Electric Café. Kraftwerk also embarked on the extensive Minimum-Maximum world tour, using four customised Sony VAIO laptop computers,They also obtained a new set of transparent video panels to replace its four large projection screens. This greatly streamlined the running of all of the group’s sequencing, sound-generating, and visual-display software. r, replacing manual playing with interactive control of sequencing equipment. Hütter retained the most manual performance, still playing musical lines by hand on a controller keyboard and singing live vocals and having a repeating ostinato. Schneider’s live vocoding had been replaced by software-controlled speech-synthesis techniques. In November, Kraftwerk at the MTV European Music Awards in Edinburgh, Scotland, performing “Aerodynamik”. In 2003 Kraftwerk released a box set entitled 12345678 (subtitled The Catalogue) featuring remastered editions of the group’s eight core studio albums, from Autobahn to Tour de France Soundtracks. The touring quartet consisted of Ralf Hütter, Henning Schmitz, Fritz Hilpert, and video technician Stefan Pfaffe, who became an official member in 2008. Original member Florian Schneider was absent from the lineup. Hütter stated that he was working on other projects. However later on Kraftwerk officially confirmed Florian Schneider’s departure from the band. Kraftwerk’s headline set at Global Gathering in Melbourne, Australia, was cancelled due to a Fritz Hilpert heart problem. In 2009, Kraftwerk performed concerts with special 3D background graphics in Wolfsburg, Germany; Manchester, UK; and Randers, Denmark. During the Manchester concert (part of the 2009 Manchester International Festival) four members of the GB cycling squad (Jason Kenny, Ed Clancy, Jamie Staff and Geraint Thomas) rode around the Velodrome while the band performed “Tour de France”. The group also played Bestival 2009 on the Isle of Wight. Kraftwerk also released The Catalogue box set It is a 12″ album-sized box set containing all eight remastered CDs in cardboard slipcases, as well as LP-sized booklets of photographs and artwork for each individual album. Ralf Hütter has also suggested that a second boxed set of their first three experimental albums—Kraftwerk, Kraftwerk 2 and Ralf and Florian—could be on its way, containing more artwork, extra contemporary drawings, graphics, and photographs to go with each album ” Kraftwerk also released an iOS app called Kraftwerk Kling Klang Machine. The Lenbach House in Munich exhibited some Kraftwerk 3-D pieces in Autumn 2011. Kraftwerk performed three concerts to open the exhibit. In 2012 Kraftwerk played at Ultra Music Festival in Miami. The Museum of Modern Art of New York also organized an exhibit titled Kraftwerk – Retrospective 1 2 3 4 5 6 7 8 where the band performed their studio discography from Autobahn to Tour de France whichlater toured to the Tate Gallery as well as to K21 in Düsseldorf. Kraftwerk performed at the No Nukes 2012 Festival in Tokyo, Japan. Kraftwerk also performed at Way Out West in Gothenburg. 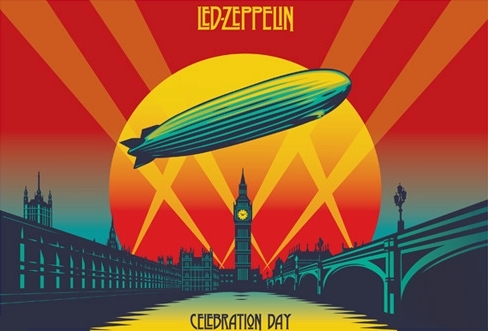 A limited edition version of the Catalogue box set was released during the retrospective, restricted to 2000 sets. Kraftwerk also performed Catalogue in Düsseldorf and at London’s Tate Modern. Kraftwerk tickets were priced at £60 in London, but fans compared that to the $20 ticket price for tickets at New York’s MoMA in 2012, which caused consternation. Kraftwerk also performed the eight albums of The Catalogue in Sydney, And In July, they performed at the 47th Montreux Jazz Festival and performed 3-D concerts at T in the Park – in Balado, Kinross, Scotland, Latitude Festival in Suffolk, and The Longitude Festival in Dublin. In 2013 the band played four concerts, at Evoluon (a former technology museum of Philips Electronics, now a conference center)in Eindhoven, Netherlands. The venue was selected by Ralf Hütter, for its retro-futuristic UFO-like architecture. Bespoke visuals of the building, with the saucer section descending from space, were displayed during the rendition of Spacelab. In 2014, Kraftwerk performed their four-night, 3D Catalogue tour at the Walt Disney Concert Hall in Los Angeles, NYC’s United Palace Theatre, the Cirkus in Stockholm, Sweden and the music festival Summer Sonic in Tokyo, Japan. In 2014 the 3D Catalogue live set was played At the Fondation Louis-Vuitton in Paris, France and the iconic Paradiso concert hall in Amsterdam, Netherlands. Upon being told that the Tour de France would be starting that year in the nearby Dutch city of Utrecht Ralf Hütter, , decided that Kraftwerk would perform during the “Grand Depart”. Kraftwerk also played three concerts in TivoliVredenburg performing “Tour de France Soundtracks” and visited the start of the Tour in-between. In 2017, Kraftwerk released 3-D The Catalogue, a live album and video documenting performances of all eight albums in The Catalogue which is available in multiple formats, the most extensive of which being a 4-disc Blu-ray set with a 236-page hardback book. Italian Renaissance artist Tintoretto sadly Died May 31, 1594. born 29 September 1518 in Venice. His real name was Jacopo Comin, and he was a notable exponent of theRenaissance school. For his phenomenal energy in painting he was termed Il Fuioso. His work is characterized by its musculr figures, dramatic gestures, and bold use of perspective in the Mannerist style, while maintaining color and light typical of the Venetian School. In his youth, Tintoretto was also known as Jacopo Robusti as his father had defended the gates of Padua in a way that others called robust, against the imperial troops during the War of the League of Cambrai (1509–1516). Tintoretto was the eldest of 21 children. His father, Giovanni, was a dyer, or tintore; hence the son got the nickname of Tintoretto, little dyer, or dyer’s boy, which is anglicized as Tintoret. The family originated from Brescia, in Lombardy, then part of theRepublic of Venice. In childhood Jacopo, a born painter, began daubing on the dyer’s walls; his father, noticing his talent took him to the studio of Titian to see how far he could be trained as an artist. Tintoretto had only been ten days in the studio when Titian sent him home once and for all, Titian mayhave judged that young Jacopo, although he might become a painter, would never be properly a pupil.From this time forward the two always remained upon distant terms, Tintoretto being indeed a professed and ardent admirer of Titian, but never a friend, and Titian and his adherents turning the cold shoulder to him. His noble conception of art and his high personal ambition were evidenced in the inscription which he placed over his studio Il disegno di Michelangelo ed il colorito di Tiziano (“Michelangelo’s design and Titian’s color”). The Embarkation of St Helena in the Holy Land was one of a series of three paintings by Tintoretto, depicting the legend of St Helena And The Holy Cross. The Embarkation of St Helena was acquired by the V&A in 1865. Its sister paintings, The Discovery Of The True Cross and St Helen Testing The True Cross, are held in galleries in the USA.Towards 1546 Tintoretto painted three of his best known works – the Worship of the Golden Calf, thePresentation of the Virgin in the Temple, and the Last Judgment for the church of the Madonna dell’Orto, and settled down in a house by the church overlooking the Fondamenta de Mori, which is still standing. In 1548 he was commissioned for four pictures in the Scuola di S. Marco: the Finding of the body of St Mark, the St Mark’s Body Brought to Venice, St Mark Rescuing a Saracen from Shipwreck and the Miracle of the Slave. (these three are in Gallerie dell’Accademia in Venice). Having painted these He was financially secure and was able to marry Faustina de Vescovi , daughter of a Venetian nobleman who was the guardian grande of the Scuola Grande di San Marco, who bore him several children. Between 1565 and 1567, and again from 1575 to 1588, Tintoretto produced a large number of paintings for the walls and ceilings of the Scuola Grande di San Rocco . In 1560 five painters, including Tintoretto and Paolo Veronese, were invited to send in trial-designs for the centre-piece in the smaller hall named Sala dell’Albergo, In 1565 he resumed work at the scuola, painting the magnificent Crucifixion, In 1576 he presented another centre-piece—that for the ceiling of the great hall, representing the Plague of Serpents; and completed this ceiling with pictures of the Paschal Feast and Moses striking the Rock . 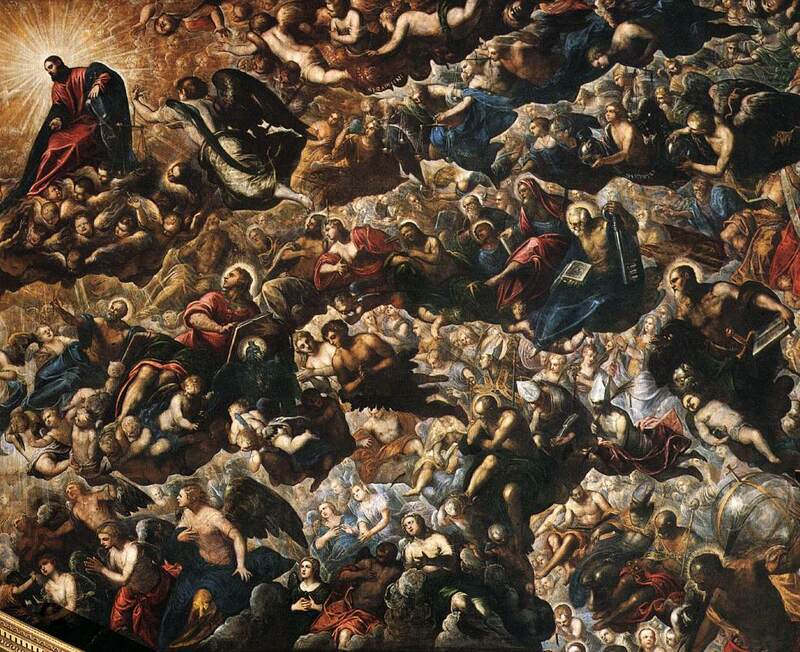 Next Tintoretto paintedthe entire scuola and of the adjacent church of San Rocco. In total the scuola and church contain fifty-two memorable paintings, such as Adam and Eve, the Visitation, the Adoration of the Magi, the Massacre of the Innocents, the Agony in the Garden, Christ before Pilate, Christ carrying His Cross, the Assumption of the Virgin. Tintoretto also did numerous paintings in the Doge’s Palace; including a portrait of the doge, Girolamo Priuli, the Excommunication of Frederick Barbarossa by Pope Alexander III, the Victory of Lepanto and The Deliverance of Arsenoe. Sadly though most were destroyed by a fire. With help from Paolo Veronese, his colleague at the Sala dell Anticollegio, Tintoretto painted four masterpieces – Bacchus, with Ariadne crowned by Venus, the Three Graces and Mercury. He also painted, Minerva discarding Mars, the Forge of Vulcan, Queen of the Sea , theEspousal of St Catherine to Jesus , St George and St Nicholas, with St Margaret and St Jerome and St Andrew and nine large compositions, chiefly battle-pieces including the Capture of Zara from the Hungarians in 1346 amid a Hurricane of Missiles and arguably the crowning production of Tintoretto’s life, “Paradise” which is reputed to be the largest painting ever done upon canvas. A fter the completion of the Paradise Tintoretto rested for a while, and he never undertook any other work of importance. In 1592 he became a member of the Scuola dei Mercanti. In 1594, he developed severe stomach pains, and a fever, that prevented him from sleeping and eating much and was buried in the church of the Madonna dell’Orto by the side of his favorite daughter Marietta, who had died in 1590 at the age of thirty. Tradition suggests that as she lay in her final repose, her heart-stricken father had painted her final portrait. Musician Darryl Mc Daniels was born 31 May 1964. Run–D.M.C. were an American hip hop group from Hollis, Queens, New York, founded in 1981 by Joseph “Run” Simmons, Darryl “D.M.C.” McDaniels, and Jason “Jam Master Jay” Mizell. The group is widely acknowledged as one of the most influential acts in the history of hip hop culture. Run–D.M.C. was one of the most well-known hip hop acts in the 1980s who, along with LL Cool J, The Beastie Boys, and Public Enemy signified the advent of the new school of hip hop music. They were the first group in the genre to have a gold album (Run–D.M.C., 1984) and be nominated for a Grammy Award. They were the first to earn a platinum record (King of Rock, 1985), the first to earn a multiplatinum certification (Raising Hell, 1986) the first to have videos on MTV, the first to appear on American Bandstand and the cover of Rolling Stone. World No Tobacco Day (WNTD) is observed annually on May 31. It is intended to encourage a 24-hour period of abstinence from all forms of tobacco consumption around the globe an action they hoped would provide assistance for those trying to quit. The day is further intended to draw attention to the widespread prevalence of tobacco use and to negative health effects, which currently lead to nearly 6 million deaths each year worldwide, including 600,000 of which are the result of non-smokers being exposed to second-hand smoke. The member states of the World Health Organization (WHO) created World No Tobacco Day in 1987. In the past twenty nine years, the day has been met with both enthusiasm and resistance around the globe from governments, public health organizations, smokers, growers, and the tobacco industry. WNTD is one of eight official global public health campaigns marked by the WHO, along with World Health Day, World Blood Donor Day, World Immunization Week, World Tuberculosis Day, World Malaria Day, World Hepatitis Day, and World AIDS Day. 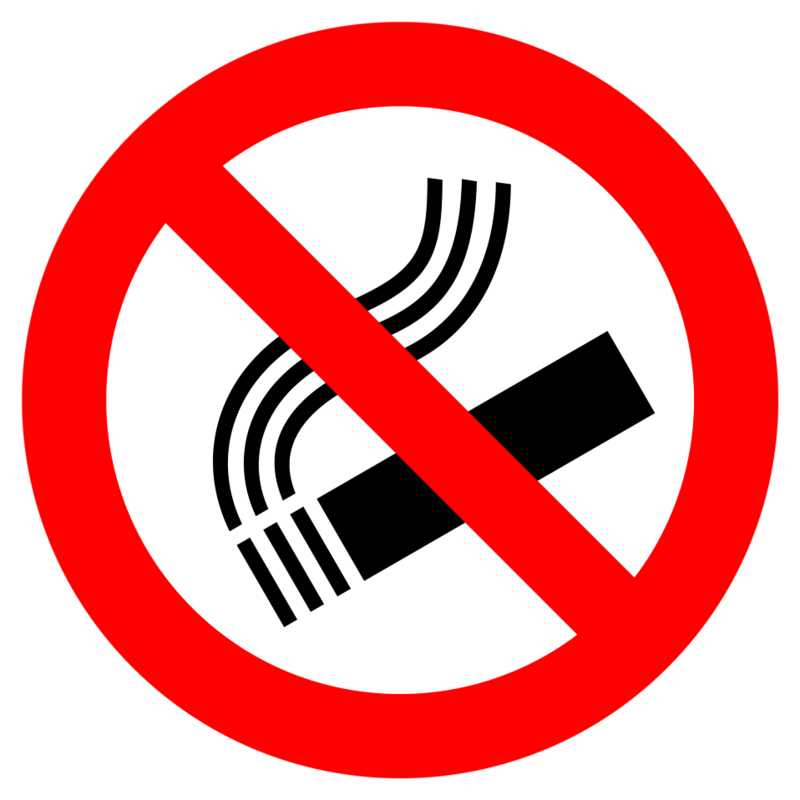 It began In 1987, after the WHO’s World Health Assembly passed a Resolution calling for April 7, 1988 to be “a world no-smoking day”. The objective of the day was to urge tobacco users worldwide to abstain from using tobacco products for 24 hours, an action they hoped would provide assistance for those trying to quit. In 1988, Resolution WHA42.19 was passed by the World Health Assembly, calling for the celebration of World No Tobacco Day, every year on May 31. Since then, the WHO has supported World No Tobacco Day every year, linking each year to a different tobacco-related theme. In 1998, the WHO established the Tobacco Free Initiative (TFI), an attempt to focus international resources and attention on the global health issue of tobacco. The initiative provides assistance for creating global public health policy, encourages mobilization between societies, and supports the World Health Organization Framework Convention on Tobacco Control (FCTC). The WHO FCTC is a global public health treaty adopted in 2003 by countries around the globe as an agreement to implement policies that work towards tobacco cessation. In 2008, on the eve of the World No Tobacco Day, the WHO called for a worldwide ban on all tobacco advertising, promotion, and sponsorship. The theme of that year’s day was ″Tobacco-free youth″; therefore, this initiative was especially meant to target advertising efforts aimed at youth. According to the WHO, the tobacco industry must replace older quitting or dying smokers with younger consumers. Because of this, marketing strategies are commonly observed in places that will attract youth such as movies, the Internet, billboards, and magazines. Studies have shown that the more youth are exposed to tobacco advertising, the more likely they are to smoke. In 2015, WNTD highlighted the health risks associated with tobacco use and advocated for effective policies to reduce tobacco consumption, including ending the illicit trade of tobacco products. In 2017, WNTD is focusing on tobacco as “a threat to development.” The campaign aims to demonstrate the threats that the tobacco industry poses to sustainable development, including the health and economic well-being of citizens in all countries. Each year, the WHO selects a theme for the day to create a global message for WNTD which becomes the central component of the WHO’s tobacco-related agenda for the following year. In many of its WNTD themes and related publicity-materials, the WHO emphasizes the idea of “truth.” Theme titles such as “Tobacco kills, don’t be duped” (2000) and “Tobacco: deadly in any form or disguise” (2006) indicate a WHO belief that individuals may be misled or confused about the true nature of tobacco; the rationale for the 2000 and 2008 WNTD themes identify the marketing strategies and “illusions” created by the tobacco industry as a primary source of this confusion. The WHO’s WNTD materials present an alternate understanding of the “facts” as seen from a global public health perspective. WNTD publicity materials provide an “official” interpretation of the most up-to-date tobacco-related research and statistics and provide a common ground from which to formulate anti-tobacco arguments around the world. Since 1988 the WHO has presented one or more awards to organizations or individuals who have made exceptional contributions to reducing tobacco consumption. World No Tobacco Day Awards are given to individuals from six different world regions (Africa, Americas, Eastern Mediterranean, Europe, South-East Asia, and Western Pacific), and Director-General Special Awards and Recognition Certificates are given to individuals from any region. Groups around the world — from local clubs to city councils to national governments, are encouraged by the WHO to organize events each year to help communities celebrate World No Tobacco Day in their own way at the local level. Past events have included letter writing campaigns to government officials and local newspapers, marches, public debates, local and national publicity campaigns, anti-tobacco activist meetings, educational programming, and public art. Many governments also use WNTD as the start date for implementing new smoking bans and tobacco control efforts. The day has also been used as a springboard for discussing the current and future state of a country as it relates to tobacco—for example in India which, with 275 million tobacco users, has one of the highest levels of tobacco consumption in the world. Since 31 May 1987 the WHO has supported World No Tobacco Day every year, linking each year to a different tobacco-related theme. In 1998, the WHO established the Tobacco Free Initiative (TFI), an attempt to focus international resources and attention on the global health issue of tobacco. The initiative provides assistance for creating global public health policy, encourages mobilization between societies, and supports the World Health Organization Framework Convention on Tobacco Control (FCTC). The WHO FCTC is a global public health treaty adopted in 2003 by countries around the globe as an agreement to implement policies that work towards tobacco cessation. In 2008, on the eve of the World No Tobacco Day, the WHO called for a worldwide ban on all tobacco advertising, promotion, and sponsorship. The theme for 2008 was ″Tobacco-free youth″; this initiative was especially meant to target advertising efforts aimed at youth. According to the WHO, the tobacco industry must replace older quitting or dying smokers with younger consumers. Because of this, marketing strategies are commonly observed in places that will attract youth such as movies, the Internet, billboards, and magazines. Studies have shown that the more youth are exposed to tobacco advertising, the more likely they are to smoke. In 2015, WNTD highlighted the health risks associated with tobacco use and advocated for effective policies to reduce tobacco consumption, including ending the illicit trade of tobacco products. In 2017, WNTD focussed on tobacco as “a threat to development.” The campaign aims to demonstrate the threats that the tobacco industry poses to sustainable development, including the health and economic well-being of citizens in all countries.